Today, when we speak of content marketing, many think of it as something new and Internet related. It’s not, and here’s what we can learn from and old and surprisingly lean star. Say content marketing, and most thoughts go straight to company blogs or social media marketing of web content. But if we look up the term content marketing in Wikipedia it’s defined as “any marketing format that involves the creation and sharing of media and publishing content in order to acquire customers”. Not only is that a lot more than web postings, it has existed as mass marketing since the 19th century. Always start with your target group, their needs and wishes. Cars need tires, but cars don’t buy them – people do. For the majority of people, car tires are a low interest product. Most of us don’t think about them until we need new ones, and hope it’s not soon. We don’t like to have to buy them. The car enthusiasts are the exception, but they’re a tiny group compared to the total of car owners. So what if you instead look at a target group that goes for long drives and thereby wears out tires more frequently – what do that have in common? Sooner or later they have to stop for food! This you can know without asking (which was good for Michelin, since market research was a bit more cumbersome in those days). It addresses a primary need, universal to all humans who own a car. Thereby the guide solved a real problem for the target group long before McDonalds or the GPS could help you on your way. What is it you target group really needs or wants that indirectly sells your products? Writing about your product is not always the best way to sell it. Users who drive a lot wear out their tires and need new ones more often. If your brand name is top-of-mind when they do, they’ll definitely consider or even chose you. Therefore the goal of the marketing was to make the target group want to drive more and longer – maybe even a detour. So why not write about restaurants so fabulous they are worth extra mileage? Not only does this give many more exciting things to write about, it is more interesting for the user on a continued basis. If you don’t care about the tires until you need new ones, how often would you want to read about them, really? I don’t know about you, but good food in great travel destinations I could read about every day, travelling or not. 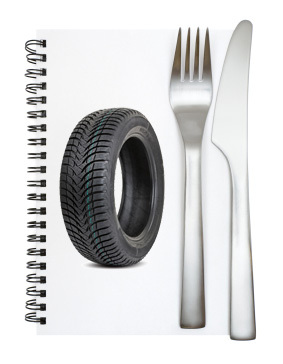 The competitors were probably all still only writing about the fabulous attributes of their tires while Michelin could soon laugh all the way to the restaurant. So challenge yourself and step out of the brand you work for a moment. See if you have an equally unique perspective that is relevant to your product and marketing goals without talking about the product itself. Chances are, it will separate you from the rest – in a relevant way. And creating content will become much easier and more fun as well. Adjust the development continually based on response/ action. The Michelin Guide started as a simple guide for roadside food in France but has developed into an international icon of the good life – and a status symbol. A promo from a tire producer – who would have thought? Many advertisers have trouble trusting the actions and advice from target group enough to act upon it. Having the target group change on you doesn’t make it easier (from mainstream to gourmet and broader again, in this case). Many things indicate that the Michelin brothers were visionary here as well – they kept track. On the company webpage we can read how André Michelin in 1920 found the then free guide from Michelin used to prop up an unsteady workbench in an auto shop and concluded that people only respect what they pay for. From there the guide went from being financed by advertising to becoming a purchase product without ads. To be worth the money the guide needed to be upgraded, and the rest is an historic evolution of a brand. Remind you of any Internett-startups you know? This shows a bold, user-centric approach, way ahead of it’s time. It’s also remarkably lean long before lean management and much less lean marketing was even thought of. To this day many advertisers refuse to trust the customer this much in spite of the fact that good, valid data is now right at their fingertips. Both gathering the data and using them in a meaningful, analytical whole is so much easier and safer today, so use it for all its worth. With today’s Internet you have easy access to greater and more secure data, better and cheaper distribution channels and simpler follow-up and development. You also have a short way to many more customers in many more channels at once. So the next time you feel content marketing is just too much work, think of the Michelin Brothers going from auto shop to auto shop to see how their brochure is doing. You don’t have to visit a single customer to find out how your marketing works – you can reach out to all of them in seconds – even the ones you don’t have yet, across the globe. All you have to remember is that still it’s all about generating valuable content that your target group will both need and share. All to keep you top of mind the next time they need what you have to offer. This entry was posted in digital marketing, Inbound Marketing, lean creative, Lean marketing, Marketing strategy and tagged articles, bloging, brand building, channels, direct mail, distribution, DM, ideas, michelin, tips, tricks, viral, web content, wors-of-mouth, writing on 09/08/2013 by Annette Kallevig. Charmed by the web i 1999 after many years as advertising Art Director in New York and Oslo. Now I´m all about about result driven web marketing, as a web marketer, teacher and coach. I run my own agency, webROI as.